Last night my partner and a friend of ours spent the evening dancing with Imelda Marcos and about 200 other strangers at The Public Theater’s Here Lies Love, and unlike many others from her time as the First Lady of the Philippines, we lived to tell the tale. With music by Talking Head’s David Byrne and directed with endless inventiveness by wunderkind Alex Timbers, I found the show to be a totally unique and enjoyable theatrical experience. While my two theater companions respected but didn’t love the show, I was completely taken in by the groovy, infectious melodies and the seductive choreography. And though I’m usually not a fan of any sort of interactive theater, I gave myself over wholly to the fact that my involvement in the proceedings was going to be integral to my enjoyment of the experience. And boy am I glad that I did. I’m not going to attempt to summarize the show’s narrative ambitions — Ben Brantley does a pretty good job of that in his rave New York Times review — except to say we follow Imelda as she journeys from innocent but ambitious country girl to hedonistic ruler. I found the first part of that journey most effectively told — the nightclub setting, David Korin’s mindblowing modular set, and Clint Ramos’ fabulous costumes all served as the perfect backdrop to Imelda’s ascent to power. As Imelda and her husband Ferdinand become more ruthless in their quest for power, though, the attempt to dramatize their disturbing impact as rulers doesn’t fit quite as comfortably in the disco setting, and the show loses particular focus in the final 20 minutes, moving away from Imelda’s perspective to that of Ferdinand’s political rival, and voice of the liberals, Aquino. Additionally, for a show in which the audience’s energy is integral, I couldn’t help but sense a bit of fatigue at moving through the space start to set in. But these are quibbles — all in all, the experience was thrilling. You couldn’t help but notice the similarities between this show and Andrew Lloyd Weber’s Evita, also about a powerful leader’s wife, but the experience of Here Lies Love is so unique it’s hard to truly compare the two. This is the strongest work I’ve seen Timbers do; more so, even, than in Bloody Bloody Andrew Jackson, he and his design team have turned all traditional notions of how we experience musical theater completely on its head. 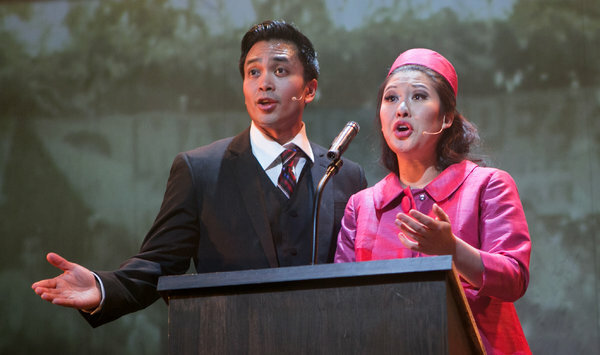 I must also give credit to the flawless cast, including Jose Llana as Ferdinand and Conrad Ricamora as Aquino, but most especially Ruthie Ann Miles as Imelda. Miles is on stage throughout the entire proceedings, belting her face off, and she marked subtle changes in Imelda’s evolution brilliantly. It was a total star-making performance. If you haven’t yet seen the show, head down to The Public to get your groove on. And make sure to wear comfortable shoes. Here Lies Love is playing at The Public Theater. Running time is 100 minutes with no intermission. This entry was posted in Theater and tagged Alex Timbers, Here Lies Love, Public Theater. Bookmark the permalink.